"Super easy. Break the glass and blow through the tube. The crystals changed from a yellow to blue so I knew my buddy was over the limit." "Made a great give away for our annual safety awareness event. Thanks!" For making a quick assessment of intoxication, no product beats the Safeway Disposable Alcohol tester. The Safeway solution is a no-fuss one-time disposable alcohol detection unit that can detect drunkenness accurately. For a sobriety check, this one-time breath alcohol tester provides accurate and fast results. The test works via a colorimetric alcohol detection method. Specially coated crystals inside the test tube will change in color when they are exposed to the ethanol in alcohol. 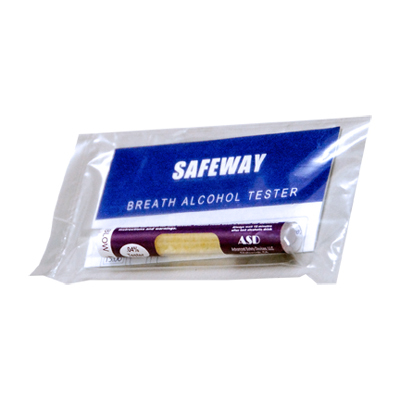 SafeWay breathalyzer is a simple to use sobriety tester. Simply squeeze to break the vial inside the plastic tube, then exhale into the device, and watch for a change in color if alcohol was present. It is that simple! Safeway is a quick and super low-cost alternative for determining sobriety or intoxication. 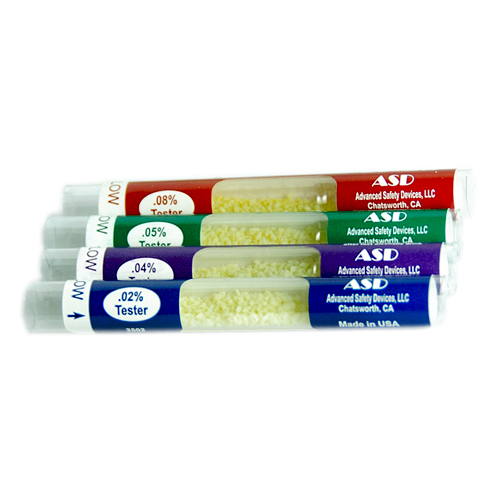 Safeway tests are available in four easy to use testing concentrations, including .02%, .04%, .05%, and .08% BAC levels. Safeway is color-coded for ease of use .02% (blue), .04% (purple), .05% (green), and .08% (red). Specially-coated crystals inside the tube are super sensitive to ethanol molecule presence and react with these molecules to cause a color change that indicates the presence of alcohol above a certain level. SafeWay alcohol testers can be utilized to rapidly assess alcohol intoxication for personal screening or public testing as required by law enforcement agencies. How SafeWay Disposable Testers Works? As Alcohol metabolized, a certain percentage of the ethanol enters blood circulation and escapes through the lungs membrane into our breath cycle. The determination of blood alcohol concentration and its presence is based on a chemical reaction between the exhaled ethanol and the specially coated crystals of the SafeWay unit. In the presence of ethanol, the breathalyzer crystals change color to indicate a positive test for certain level of alcohol. The test utilizes crystals that are coated with a compound that is very sensitive and specific to the presence of certain level of ethanol. The SafeWay disposable alcohol tester keeps the crystals fresh in a hermetically sealed glass ampoule until the test is administered- immediately prior to use, the ampoule is ruptured by slight finger pressure on the outer flexible plastic tube to release the crystals within the confines of the tube. The crystals react upon exposure to the alcohol molecules present in subject's breath by changing color from yellow to bluish white. If all of the crystals turn blue, the person's blood alcohol is at or above the %BAC of that particular test. SafeWay testers are used to measure blood alcohol concentration at four critical levels of .02% ( zero tolerance), .04% (the US Military abroad, .05% ( all US Armed forces and as a safeguard against the legal Limit of .08, and finally .08% testers that test for the legal limit across the united States. The SafeWay disposable breathalyzer provides a convenient and accurate colorimetric test based on a well understood chemistry. This reliability makes SafeWay ideal for screening use by a large host of users.